Chateau Taillefer is one of the largest producers in the Pomerol region, which is the smallest red wine region in Bordeaux. Merlot is the dominant variety in Pomerols, which generally means (1) they have a higher alcohol content; (2) they have softer tannins; and (3) although top Pomerols evolve well in the cellar, most are ready to be drunk early. Robert Parker notes that restaurants dig Pomerols specifically because they come ready-to-drink. The PLCB boasts that Wine & Spirits gave this wine 90 points. To borrow a phrase from one of my good friends, I’d take that with a pillar of salt. Parker doesn’t have much love for this chateau. 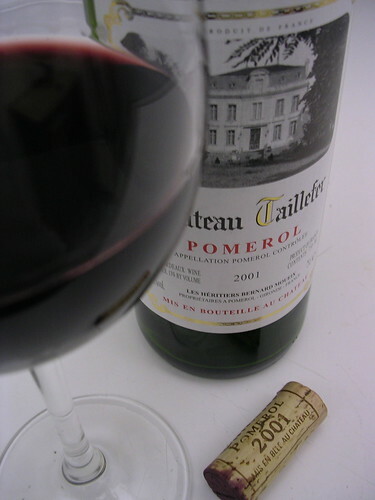 Although he lists Taillefer as a “notable” Pomerol property, he feels that, because it is one of the larger properties, it should be making better wine. On the nose: Red berry and peppery aroma. On the palate: The 2001 Taillefer is a blend of 75% Merlot and 25% Cabernet Franc, both of which are supposed to make this wine approachable at an early age. This wine, however, may still be too young to drink. It starts off a bit thin and watery. As it opens up, some red fruit and light raspberry finally emerge, followed by hints of spice, new oak and chocolate. The tannins could be softer and the acidity should be a little lower, but these rough edges are the privileges of youth. There’s not much of a finish. This wine shows some promise; it would be interesting to see how it matures in 3 to 5 years. On the wallet: This wine is one of the PLCB’s Chairman’s Selections, a designation apparently meant to highlight the PLCB’s “buying power.” The PLCB claims this wine normally goes for $44.99, but thanks to the PLCB you can drive this baby home for the low, low price of $19.99. However, the $25.00 “savings” should not be the measure of whether this is a good deal; the wine needs to stand on its own at $19.99. Pomerols are supposed to come ready-to-drink, but this wine is still a bit too young. Plus, it’s not as gentle or as fruity as a Pomerol should be, which is surprising given that Cabernet Franc is in the mix. A little time may resolve these issues, but you may not have the patience to cellar something from this chateau. This is a good Bordeaux and it has potential. But $19.99 may be slightly ambitious for a wine that is not quite ready to come out of the oven. On the table: Steak and burgers. I don't know. I'm disappointed in you, Joe. I was led to believe you were on the forefront with this sign thing, but it looks like Casa D'Ice in Pittsburgh has you beat, bro. I mean, you don't need a Hummer with a P.A. system if you've got a sign like that. And Casa D'Ice even has more where that came from. You know, I bet their cheesesteak is even better than yours. WWGD: What Would Geno’s Do? What puzzles me is this: the inflammatory signs at Geno’s have received national attention, scarring Philadelphia’s image and eroding its reputation as the City of Brotherly Love. People in Philly are pissed at Geno’s owner, Joe Vento; he has received complaint letters and even death threats. So, then, why hasn’t any non-English speaking, cheesesteak lover filed a private law suit against Geno’s? To put it in plain English (because, of course, that’s what Geno’s wants us to do), if you believe someone discriminated against you in violation of Philly’s Fair Practices Code, it looks like you don’t have to wait for a green light from some administrative agency before you go to court, which is sorta like not having to wait in line to get your cheesesteak after you stumble out of Ray’s Happy Birthday Bar at 2:00 a.m. on a Saturday morning. Plus, the Code allows you to ask for attorney’s fees, which is kinda like having Geno’s pay someone to stand in line to get you a Whiz wit. Capisce? All I’m saying is, ask yourself this question: If you’ve been wronged by Geno’s antics, why not show them that you know what it really means to be a citizen in this country and hire a lawyer? After all, isn’t that the American way? If that’s the American way, isn’t that what Geno’s would do? And if that’s what Geno’s would do, isn’t that what you should do? Speaking of the American way, I’ll end this post with a disclaimer. After all, what sign is more American than a good ol’ fashioned disclaimer? Being fond of signs themselves, I’m sure Geno’s would agree. This information is not intended to create any legal relationship between PhilaFoodie and the person reading this post. This post is not intended to create and does not create an attorney-client relationship between the reader and PhilaFoodie. (I could be Joe Vento, for all you know. Would you want Joe Vento to be your attorney? I didn’t think so.) This post is not soliciting clients and does not propose any type of transaction. You should not act or rely on any information in this post without seeking the advice of an attorney. (Again, I’m makin’ it up as I go along here. Just in case that wasn’t clear by now.) The determination of whether you need legal services and your choice of a lawyer are very important matters that should not be based on blog posts, especially posts from a food and wine blog, for cryin’ out loud. FooBooz reports that the Center City District has scheduled the next Restaurant Week for Sunday, September 10 through Friday, September 15, 2006. The Philadelphia Inquirer reported today that Gov. Rendell has proposed legislation that would allow Pennsylvania consumers to have wine shipped directly to their door from out-of-state wineries. As part of the proposal, the wineries must collect PA’s 18% Emergency Tax (a/k/a/ the “Johnstown Flood Tax”). The Inquirer article, however, implies that the glass is only half full. The article appears to express disappointment with Rendell’s proposal, stating that the “rub” is that the plan includes the consumer paying the 18% Johnstown Flood Tax on direct shipments. This apparent criticism is a bit unfair. First, the Johnstown Flood Tax had to be part of the deal. In a Feb. 20, 2006 Inquirer article, Rendell said he “would support direct shipments of wine to Pennsylvanians if it can be done with minimal loss of state revenue.” He’s talking about the Johnstown Flood Tax. The state has been feeding from that teat for over 70 years. It ain’t letting go now, if ever. Rendell admitted that the state needs that money. So there was never going to be a direct shipping law that did not include the Johnstown Flood Tax. That’s the political compromise. If people want inexpensive wine, the PLCB has plenty of offerings in their stores. The people who are going to be ordering directly from wineries aren’t going to mind paying the taxes they’ve already been conditioned to pay in exchange for the ability (finally) to choose what to drink. It could have banned direct shipments altogether. PA’s law was declared unconstitutional on Equal Protection grounds. Banning all direct shipments—from both in-state and out-of-state wineries—would have complied with the U.S. Supreme Court’s decision. Sadly, this is what some other states, such as Alabama, chose to do in response to the ruling. So, at least we’re not Alabama. It could have had the wine being shipped directly to state stores instead of your door. Proponents of this option argued that if direct shipment is allowed at all, the shipments must go directly to the state stores because (1) that’s the only way to collect the Johnstown Flood Tax; and (2) underage kids would be ordering wine. Both of these arguments have been debunked. Taxes can be collected through a license procedure, which is part of Rendell’s plan. That’s how other states have done it, and if you couldn’t figure that one out, you probably don’t deserve to be a state legislator. Also, other states haven’t had any problems with direct shipment leading to underage drinking. It could have made direct shipment even more expensive. My understanding is that if you want to order wine through the PLCB’s Special Liquor Order (“SLO”) process, they tack on a 30% mark-up in addition to the Johnstown Flood Tax. When Rendell signaled that the direct-shipping plan needed to be done “with a minimal loss of state revenue,” it was unclear how the 30% mark-up factored into the equation. If you could order directly from the winery, there would be no need to do an SLO, which would mean lost revenue for the state. While taxes can be collected from the out-of-state wineries through the permit process, the 30% mark-up may be a different story. So, my concern was that the proposal actually would include an increase to the Johnstown Flood Tax to make up for any anticipated loss in revenue from potentially not being able to collect the 30% mark-up. It didn’t. Be thankful. But there may be a few bugs in Rendell’s proposal. It is not clear from the Inquirer article whether the proposal allows restaurants to order directly from out-of-state wineries. The article says that Pennsylvania wineries would lose their right to ship directly to restaurants. However, Kevin Joyce, the owner of the Carlton Restaurant in Pittsburgh and the president of the Pennsylvania Restaurant Association, implies that the ban extends to out-of-state wineries as well. If Joyce is correct, that could be a problem. First, it may raise further Equal Protection issues. Second, if out-of-state wineries can’t ship directly to restaurants, it could be a disincentive for out-of-state wineries to apply for direct shipping permits. And, ultimately, that could translate into consumers not having that many additional choices, which was the whole point of allowing direct shipment in the first place.